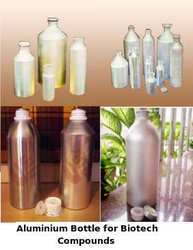 Prominent & Leading Manufacturer from Bengaluru, we offer aluminium bottle for biotech compound. Aluminum Bottle for Biotech Compound offered feature rigid seamless/no joint finish that makes them leak proof. Coming constructed using superior grade aluminum, these are available in size options of 50 ml, 100 ml, 125 ml, 250ml, 300 ml, 500ml, 625 ml, 1250 ml, 1000 ml, 2000 ml, 2500 ml, 3000ml 4000 ml, 5000 ml, 6000 ml, 12 liters & 27 liters. For superior construction quality, the bottles are made in single piece finish using extrusion from solid ‘slug’ of metal through carefully controlled shaping process. Further, the bottle can be supplied as internally lacquered or as standard and can successfully withstand high pressure. Being resistant to corrosion, these bottles are suitable for aqueous formulations and can hold contents safely at temperatures up to 50 degrees C.
Looking for Aluminium Bottle for Biotech Compound ?